It’s hard to believe the 2015-16 season will be Miami’s 10th at Cady Arena. 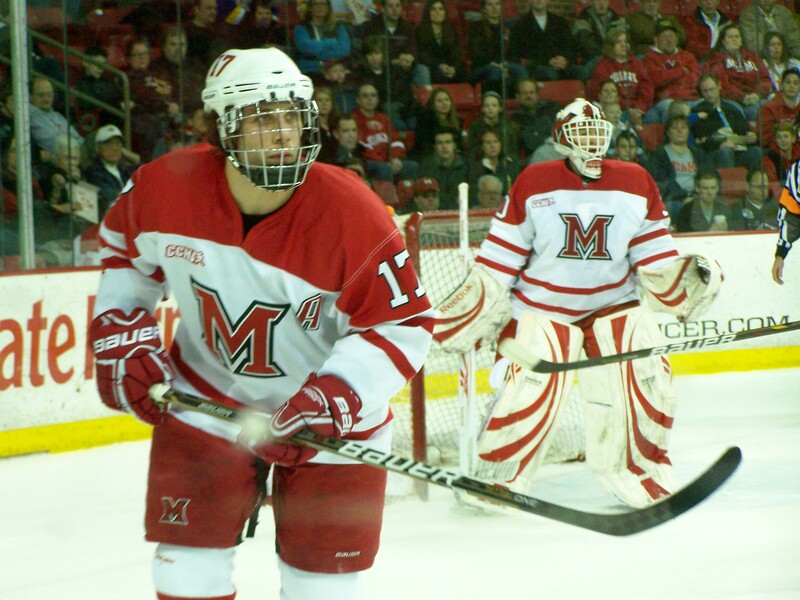 From opening night in 2006, a 5-2 win over Denver in the Ice Breaker, to the RedHawks’ series-clinching 4-0 win over Western Michigan in the best-of-3 series in the NCHC Tournament in March, much of the RedHawks’ rich history has been made in recent years at the picturesque rink on the south side of Oxford. And many outstanding players have laced up their skates there, some of which are currently in the NHL, and many more just one step below in the AHL. 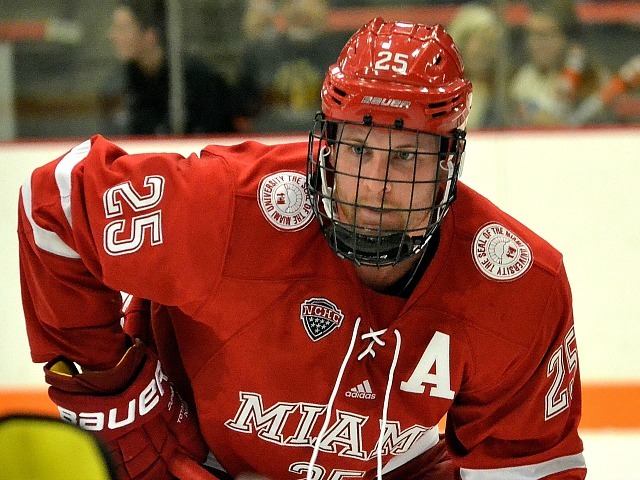 The Blog of Brotherhood takes a look at some of the top players that have taken the ice for Miami in recent years in its All-Cady Arena First-Decade Team. These are players that were the best during their time in Oxford, not necessarily the most successful in their college hockey afterlives. Miami has produced several excellent goaltenders since opening the doors at Cady Arena, but Zatkoff stands alone at the top. He played one season at Goggin Arena and his final two at Cady, where he posted a 1.94 goals-against average and a .927 save percentage. Zatkoff’s 1.96 GAA is the second-best all-time at Miami, and he is tops in career save percentage at .927 (he went 2.02 and .928 in 2005-06, the final season at Goggin). 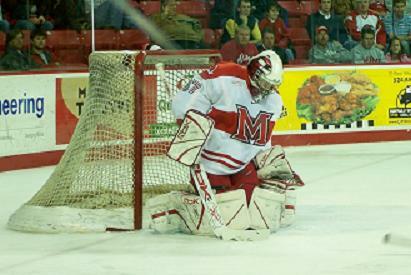 He finished his three-year career with seven shutouts, and he left for the pros after his junior season. Miami did not have the defensive depth it has boasted for the past several seasons when Zatkoff was between the pipes, making his numbers even more impressive. The RedHawks were not NCAA Tournament regulars when this rink opened, but by the time Zatkoff left Oxford, they were. Boston College ended all three seasons Zatkoff played for the RedHawks, but he picked up Miami’s first-ever NCAA Tournament win in 2007, holding New Hampshire to one goal in a 2-1 win. 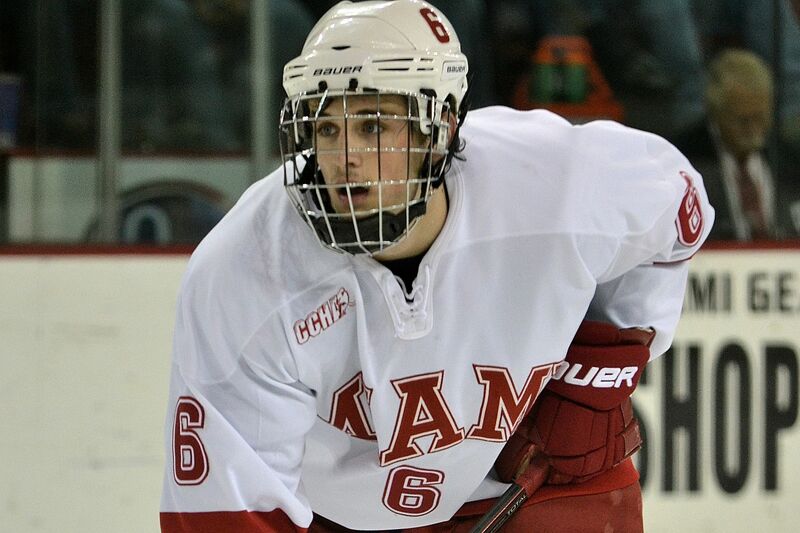 He also beat Air Force the next season to open the NCAAs and played a remarkable game in the RedHawks’ 4-3 overtime loss to BC in the regional final. Zatkoff, a third-round draft pick of the Kings, is one of just five former Miami goalies to play in the NHL, and he is second on that list in games played with 21, logging a 2.58 GAA and .913 save percentage. He played most of 2014-15 with the AHL Wilkes-Barre/Scranton Penguins, where he went 18-18-2.45-.910. Wideman recorded 12 goals and 83 assists for 95 points in 2007-12, the most points of any Miami defenseman since Mitch Ganzak. Wideman came to Oxford as a true freshman at 18 and went 0-26-26 his rookie campaign, earning him First-Team, All-CCHA Rookie honors. He found his scoring touch as a sophomore, netting five goals to complement 17 assists for 22 points. Wideman went 3-20-23 his junior season and 4-20-24 his final year. He was at least plus-8 each season and finished his career plus-58. At Miami, Wideman was an excellent quarterback on the power play, and it was nearly impossible to get the puck away from him or clear it past him on the man advantage. His defensive play improved greatly in his four years with the RedHawks, and despite being just 5-feet-10, he was more than able to hold his own in the defensive zone. Wideman was drafted by Ottawa in the fourth round in 2009 and is still in the Senators’ system. He was called up once by Ottawa but has yet to get into an NHL game. However, he earned the AHL’s Eddie Shore Award for the league’s top defenseman this season, as he scored 19 goals and dished for 42 assists, tallying 61 points. The latter two led all league blueliners. Wideman has played three full seasons with AHL Binghamton, where he has 30 goals and 100 assists for 130 points. He just re-signed with the Senators and should get into his first NHL games in 2015-16. The perfect complement to Wideman, LoVerde was the textbook definition of a shutdown defenseman. He had just six goals and 30 assists in four seasons at Miami, but he finished plus-67 and blocked 237 shots in 2007-11. LoVerde was a physical blueliner and a force on the penalty kill who almost never made a mistake in his own zone. While his role was mostly limited to defense with the RedHawks, he made crisp outlet passes to get the puck out of the D-Zone. And for the grinding role he played, LoVerde was highly discipline and had relatively low penalty minute totals, never reaching the 50 mark. He also overcame a heart virus that shut him down at the end of his junior season. The six-feet, 205-pounder was not drafted, and like Wideman, came to Miami as a true freshman, playing his first game at 18½. He signed with the Kings and began his pro career in the ECHL in the fall of 2011. He played a season and a half for Ontario, scoring 12 goals and picking up 29 assists in 91 games at that level, and he has played for AHL Manchester since. LoVerde has logged 184 AHL games, scoring 13 goals and dishing for 40 helpers. He was named captain this past season, and his team won the Calder Cup, with LoVerde going 2-8-10 in 19 games during Manchester’s playoff run. Smith had a decent freshman season but was off the charts his next two campaigns before turning pro. Smith scored eight goals and set up 12 as a rookie, but he blew up with 28 goals his sophomore season and 30 more his final year, during which he earned First-Team All-West honors. Despite skipping his senior season, Smith is still 29th on Miami’s all-time points list with 122, and he is tied for ninth in goals on the RedHawks’ career leaderboard (66). Rick Kuraly’s career goal record of 101 set in 1983 seems unbreakable, but Smith might’ve topped him had he stayed for a fourth season, as he needed 35 to tie it after lighting the lamp 30 times as a junior. 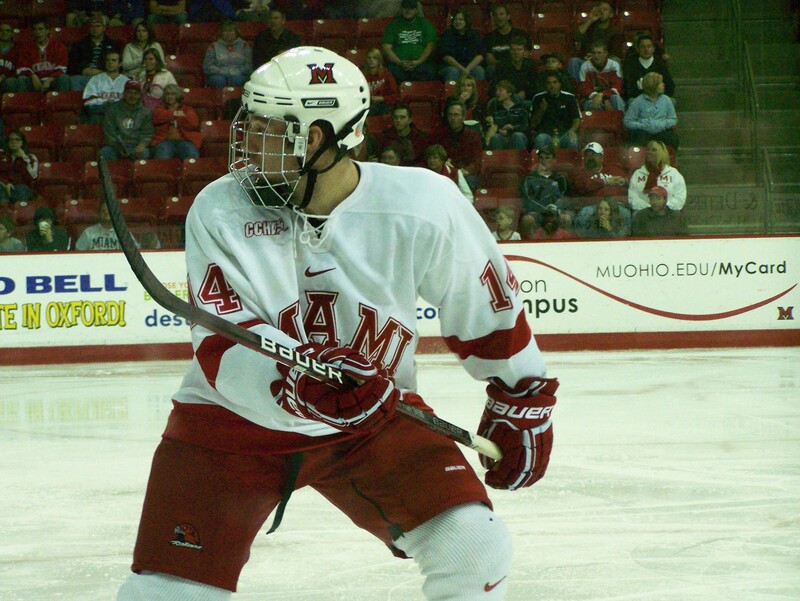 Smith improved in every aspect of his game from the first day he set foot on the ice at Cady Arena. Obviously the goal totals are eye-popping, and he got better at finding the net in his three years, but he bulked up and became markedly better defensively. 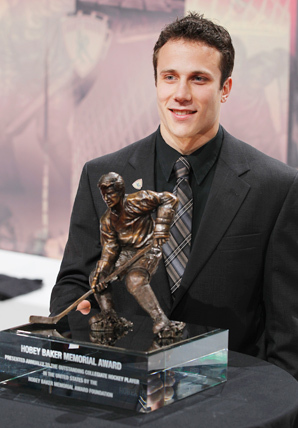 Smith only needed 45 games in the AHL – where he went 14-21-35 – before sticking for good in the NHL. He came to Boston in the Tyler Seguin deal in 2013, and he only missed one game in two seasons with the Bruins, scoring 33 goals and assisting on 58. He has exactly 100 NHL points (36 goals, 64 assists). Smith was on the move again this summer, and he will suit up for the Florida Panthers this fall. 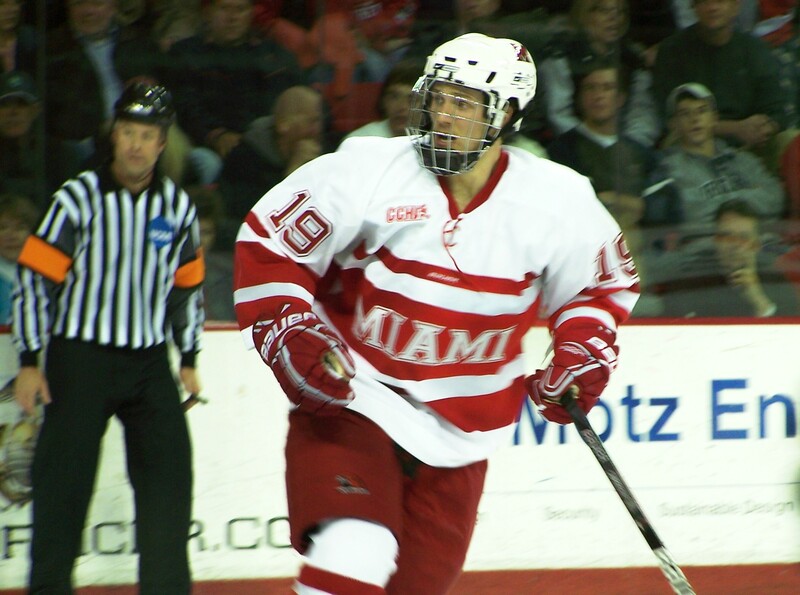 Miele is the only player in Miami history to win the Hobey Baker, awarded to college hockey’s top player. 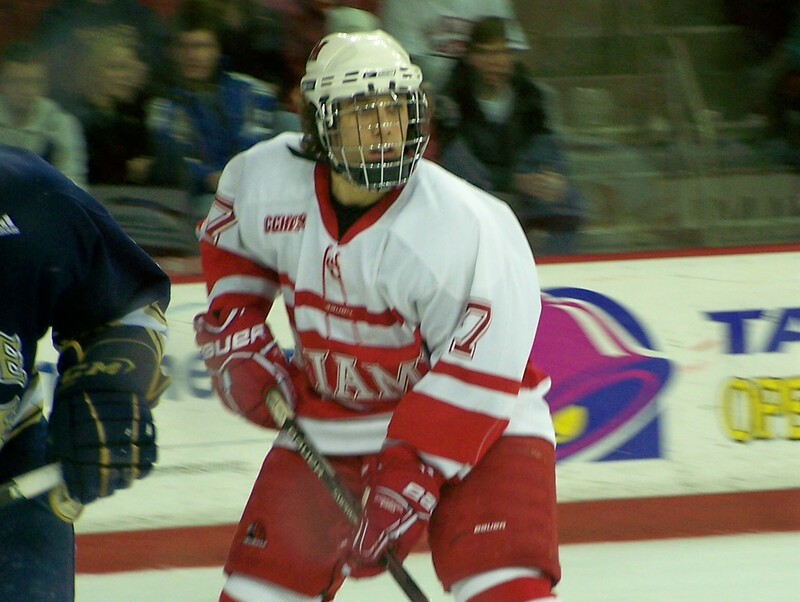 He was the only player in recent years to join the RedHawks mid-season, as he came in for the final 18 games of 2007-08 and racked up seven goals and seven assists. Miele’s points totals jumped to 31 his sophomore season, 44 his third year and an NCAA-best 71 his final campaign, during which he won the NCAA’s top individual prize. He tied for second in single-season points by a RedHawks that season and his assist total (47) is second all-time. 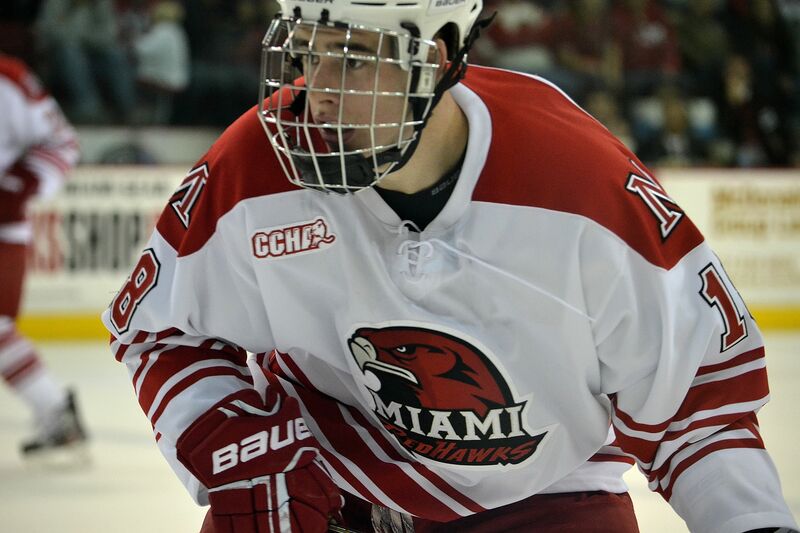 Despite playing 3½ seasons, Miele is seventh on Miami’s all-time points leaderboard with 160, and he is one of only seven RedHawks to record 100 career assists. For being 5-feet-8, Miele did it all while in Oxford. He was an outstanding penalty killer, a great playmaker and a deadly-accurate finisher. Miele played well above his size and was too elusive to take much physical punishment, and for being a small guy he would lay out the occasional hit. He played on lines with a number of forwards with Miami and his game seemed to mesh with all of them. Miele played for the Phoenix Coyotes for parts of three seasons, logging a total of 15 games and recording two assists. He is now in the Detroit Red Wings’ system. In four AHL seasons, he has 245 points. Miele was third in that league in points in 2013-14 and second last season. Picking the third forward was incredibly difficult, but because of Palmer’s all-around game, he earns the nod. He recorded 30 points as a freshman, including 11 goals. Palmer notched 35 points his sophomore season and 27 as a junior, capping his career off with an 18-27-45 campaign. He was 13th on Miami’s all-time career points leaderboard when he left Oxford with 47 goals and 90 assists for 137 points, and he is still 15th overall. Palmer never missed a game with the RedHawks and owns a school record that will be nearly impossible to break: He played in 169 games in his Miami career. With no UAF in the conference and one less playoff round in an eight-team league, the opportunities to play in more than 42 games in a season are much more scarce. Palmer’s statistics are impressive enough on their own, but the things that didn’t show up on the stats sheet really set him apart. His stickhandling was NHL caliber from Day One with the RedHawks, and he is one of the best penalty killing forwards in recent history. Palmer also won nearly every battle along the boards, even while vying with multiple opponents. His passing and scoring skills were also at an NHL level while he was still in college. And of course his durability – not only did he never miss a game, he seemingly never tired when he was on the ice. Sadly, Palmer’s pro career came to an end after just six games with his hometown Minnesota Wild, as he suffered another in a string of concussions. He did manage to score one goal while in the NHL. Palmer also logged 117 AHL games with Houston, scoring 16 times and setting up 31 more. He is currently a head coach for Sugar Land of the NA3HL. EDITS: Note in sixth paragraph. My apologies to Ryan Jones, who was definitely among the top players ever to suit up at either arena Miami hockey has called home. Former Miami stand out and Hobey Baker Memorial Award winner, Andy Miele, registered a gigantic night offensively with 2-3-5 as his Portland Pirates defeated the Manchester Monarchs 5-3 on Wednesday night. 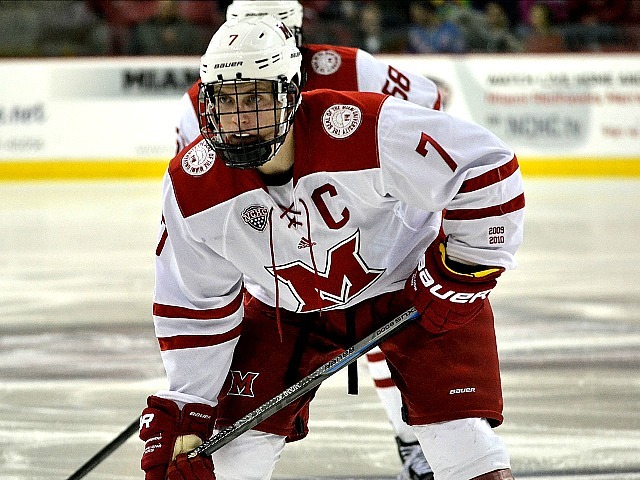 Miele, the only Hobey Baker Award winner in Miami hockey history, now has a season line of 3-4-7 in just four games with AHL Portland. And, earlier today, his performance was more than enough to earn him a quick promotion to the Pirates NHL parent club, the Phoenix Coyotes, with whom Miele signed a pro contract last spring. Presumably, Miele will suit up for his first NHL regular season game on Sunday night when the offensively challenged Coyotes (2-3-1) will face the Anaheim Ducks (4-1) at the Pond. Congratulations, again, Andy! And, best of luck in your NHL debut — whenever that may be!